Have you ever found yourself yelling incessantly or laying on your horn obnoxiously because another driver pulled out in front of you, reversed without looking, or stole your parking spot? Happy Holidays! Welcome to the craziness of the holiday shopping season and the way people act while driving – to really show off their holiday spirit. While we all want to spread holiday cheer, our blood pressure tends to increase once we enter a parking lot during this time of year. When that holiday shopping trip is interrupted by a car accident in a parking lot – a situation that could’ve been avoided – if you knew some simple rules. Therefore, before you start cursing Santa or any elves, we suggest you take some helpful tips before entering a parking lot full of other frenzied shoppers. There are no serious injuries in a parking lot because everyone is driving slowly. Sorry, Mrs. Clause, but this is false! It is a complete misconception that parking lot accidents don’t result in injuries. Many drivers are still preoccupied as they pull out of a parking spot without looking, change their radio, text while driving or just ignore who has the right of way. Distractions are at an all-time high during the holidays which results in many accidents – involving both cars and pedestrians. 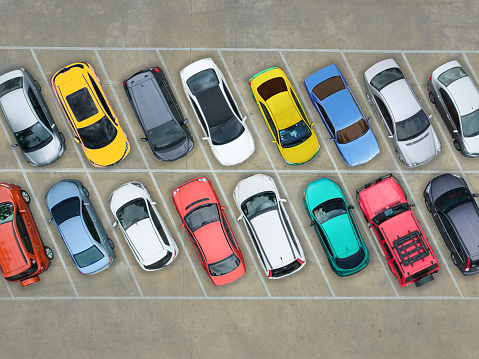 Last year, the National Safety Council estimated that there more than 50,000 parking lot accidents, which caused more than 60,000 injuries and 500 fatalities. Who has the right of way, Santa?! There are two types of lanes in a parking lot: thoroughfares and feeders. Thoroughfares connect the parking lot to the road and feeders connect to the thoroughfares. Therefore, the thoroughfares have the right of way. Exiting? If you are leaving a parking spot, the drivers in the feeder lane have the right of way. However, if they are obviously waiting for your spot, you should just yield to the other cars in the feeder lane. Crossing into the North Pole?? If you are a pedestrian, you always have the right of way – ALWAYS! All drivers must yield to pedestrians. What if two cars are backing out simultaneously? Who has the right of way? In this instance, the car backing out first should have the right of way, but sometimes this is hard to determine. Therefore, stay alert and communicate with the other driver to prevent an accident. In this case, both cars would be cited for shared fault in the accident. The parking lot doesn’t have to feel like you are getting coal in your stocking. It may never feel like the joy of Christmas morning, but hopefully these tips will provide you a way to stay safe and avoid an accident! Spread cheer and take your time to enjoy this holiday season!